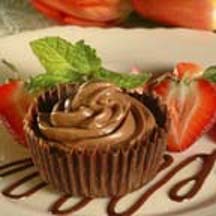 These delightful chocolate cups, filled with a rich and creamy mousse, make a wonderful treat for a holiday party or special occasion. Melt chocolate chips and vegetable shortening in microwave-safe bowl on HIGH (100%) power for 1 minute; stir. Microwave at additional 10 to 20-second intervals, stirring until smooth. Spoon 1 rounded tablespoon of chocolate mixture into 1 foil muffin cup. Rotate cup gently while using spoon or spatula to coat all sides. Place in muffin pan. Repeat with remaining chocolate mixture and foil cups. Refrigerate for 1 hour or until firm. Peel off foil liners. Place chocolate cups on serving dish. Prepare mousse mix according to steps 1 and 2 of package directions using the 2/3 cup milk. Spoon or pipe into chocolate cups. Serve immediately or store in refrigerator for 1 day. Garnish as desired.